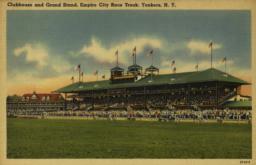 Clubhouse and Grand Stand, Empire City Race Track, Yonkers, N. Y.
Avery Classics Collection, Seymour B. Durst Old York Library Collection, Box no. 46, Item no. 489.